We do something similar, from a large bowl in a tyre at the end of our drive. Never had any money taken yet, just money and notes left. One lady paid by cheque for 4 goose eggs and left me a lovely note. Paying by cheque is quite funny for such a small amount! I put a chalkboard outside on the road when I am selling eggs, plants etc. Easy to bring inside if there is nothing to sell or we are going out. Did have an honesty box and a box with the produce in outside, but it all got stolen so now don't do it that way. For years I sold hay out of a shed some miles from home. The neighbors would take what they needed and then send me a check or bring it by. This worked fine until year before last when I was left a mess and have not quite collected from a couple hay buyers. Last year I loaded it all on trucks and hauled it home. When people are given trust they seem to be much more honest than one would expect. Of course it depends on the neighborhood and as I discovered, they don't make folks as honest as they used to. On dads farm it's just the same there is always someone there taking a few bales. they seem to pay him when it reaches a reasonable amount. 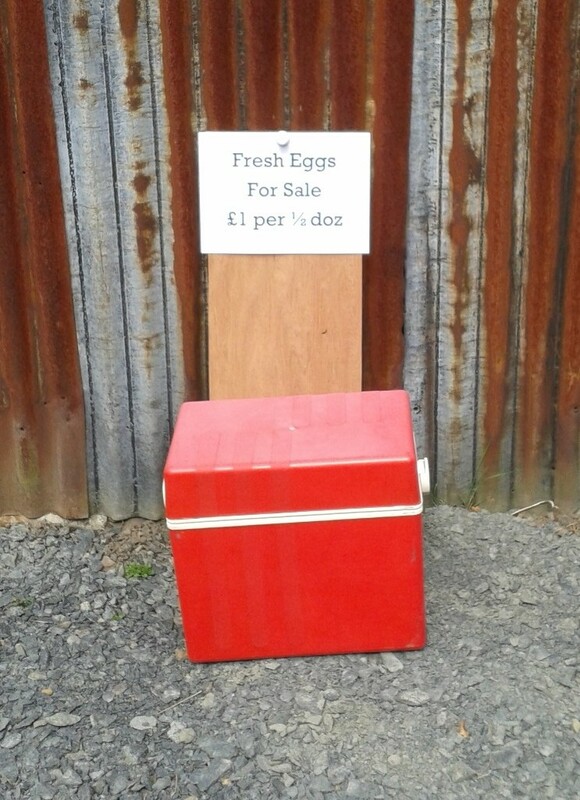 That is such a cool idea, Ive seen them around here for eggs, same price, I think you should try it with any surplus! Just charge what you think and see how it goes. Btw ive really enjoyed your last few posts, sorry i never comment but i really enjoy your blog and your wee girl is adorable! Thanks for your comment I've been enjoying your blog to - your little baby makes me broody again! I love honesty boxes for people selling their extra goods and I always leave what feels right and usually leave a little note too to say thank you and to let you know how delicious your last wares were...but sadly you don't see many these days probably for the same reasons you have mentioned above. I do use an honesty box Kev. Its quite busy here on the edge of the village and many cars pass by. Only one theft of money in several years, and that was only a pound coin! Thats the downside (or plus side most of the time) It's really quite up here so we're never going to sell much. Most of our eggs get taken in and sold at work. Most days people make an order with me! Mine are £1.50 for half a doz. You can't get even value shop bought free range eggs around here for less. 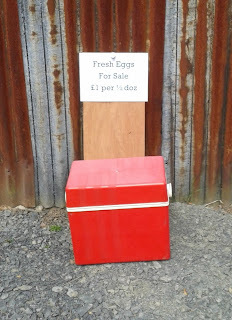 Mine are £1 for Bantam eggs, £1.30 for hens eggs and goose eggs are 50p each. And today someone paid us 31p for half a dozen, I'm hoping in was a genuine mistake and they thought the 1p was a pound, but who knows!! I think that £1 is too cheap but just down the road someone else is selling them for a pound so I have to go with the rest of the market or I'll get priced out! Wouldn't work here I'm afraid, Kev. What have I had stolen? Three cameras, two wristwatches, a laptop, three mobile phones, a circular saw, a grinder, a petrol driven water pump, a jig saw, a router, a full set of automotive workshop tools, a sony play station, a flat screen TV, a dvd player, several lpg gas bottles, three dogs, my gold coins, power drill, planer, 60 Kva diesel generator (brand new!) plus loads of stuff I have probably forgotten about. The most audacious theft, though, was when I was building my house in Benfica. I had a twenty foot shipping container on site into which I would secure all my construction materials and tools, everything from shovels to a cement mixer. One day, it was a bank holiday so no-one was on site, a Hammarlift truck drove up and just lifted the whole container! The theft that hurt me the most rather than just leaving me seething with rage, however, was when they stole Dominic's Yamaha PW50 motorcycle. The boy was heartbroken, he was only five at the time. Anything that isn't bolted down here (and even then that is no gaurantee) will get stolen. If I put an honesty box out, they'd nick the box as well. Having the whole container stolen would break my heart. 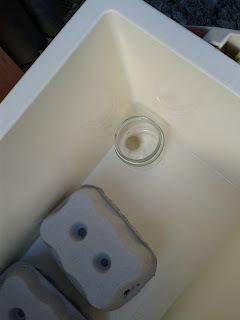 I've got a container here as I always think they're so secure - never really thought about anyone taking te whole thing! I was thinking of getting another to use as a temporary workshop until I get permission to build something a little more "concrete". It always amazes me the different culture you live in. I bet to start with it's quite a learning curve! One dog, then I raised and trained two puppies and then they were stolen. Turned out it was our own guard that was flogging them. If he is still on guard duty, it isn't on this plane.